On Saturday morning the plan was for Aneesh to take Ariyana to Ballet class while I hit the gym for a long run. But I ended up getting sidetracked with random things that needed attention at home like paying bills and gathering Ariyana's old clothes to donate. My desk was also starting to get cluttered and while I was organizing it I came across my mom's recipe for cheese and onion pie. 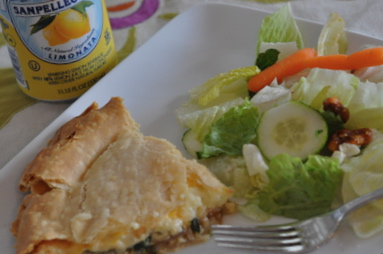 She made this for lunch a couple of weeks ago during our visit home to Raleigh, North Carolina and all of us loved it. 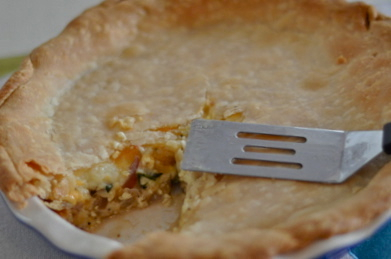 So my plan to go running didn't happen, but I was able to cross a few things off my "To Do" list and I made this delicious cheese and onion pie for lunch. 2. 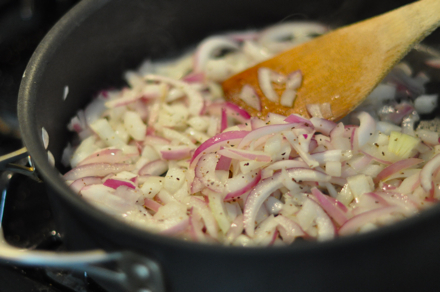 Saute onions until just clear. (about 5 min) Optional-add spinach and cook another minute. Add onion and spinach mixture to the pastry lined pan. 4. 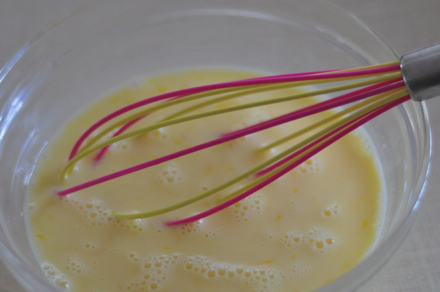 Whisk together 2 eggs and the milk and pour over the cheese and onion mixture. 5. Place second sheet of pastry over the mixture, seal edges, and cut vents in the top. 6. Bake at 400 degrees for about 40 minutes.